A very important part whenever we are writing or editing a document is to be careful with our spelling. We need to avoid having spelling mistakes is we are writing something important. Word possesses an easy to use tool which is incredibly useful: Spelling & Grammar. This will check both at once. If your document has mistakes, a window with those mistakes will appear. It will present the mistakes in your document in the order as they appear. The first thing you need to be careful about is to make sure the editing dictionary is the one you need. 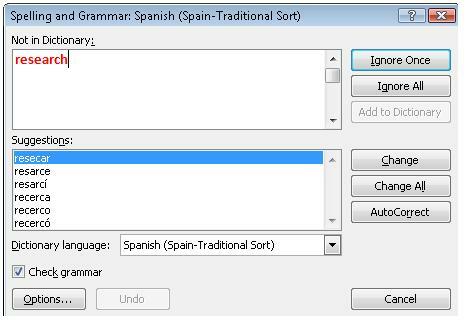 For example, in the image below we can see that the language of the dictionary is Spanish (Spain-Traditional Sort). Thus, it doesn't recognize this international word and is displaying it as a mistake. You need to run the spelling check again. The problems found in your document will be identified. Remember that this tool needs your decision and use (not automatic). For example, we can see that Spelling & Grammar has identified the word "carefullly" (in red) as not found in the dictionary. This indicates there might be a mistake. Under this window, you will find suggestions to correct that possible mistake the program has identified. 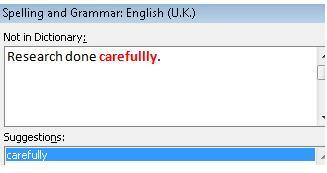 In this case, the suggestion is "carefully", as the word should be. If we ant to comply with the suggestion and fix this mistake, we click on Change. This will correct that mistake in our document. In this same manner, Word will automatically read and check your document showing you any words or phrases considered as a possible mistake. However, you will decide if you change it or not. Once Word has finished checking the spelling and grammar structuring of your document, a window will pop up letting you know the check has finished. See the image below.